Amazon has fired a shot across the bow of Apple in the days leading up to the release of the iPad mini. The Kindle Fire last year wasn’t the first 7-inch tablet, but it was the first to meet with any surt of real sales success. The Nexus 7 then made some in-roads, and Amazon came back with the Kindle Fire HD in time for the holidays and to re-establish itself as the leader of that market. With the Apple iPad mini due for release this coming Friday, obviously there will be a bit of a dog fight, and Amazon decided to fire off the first real shot. 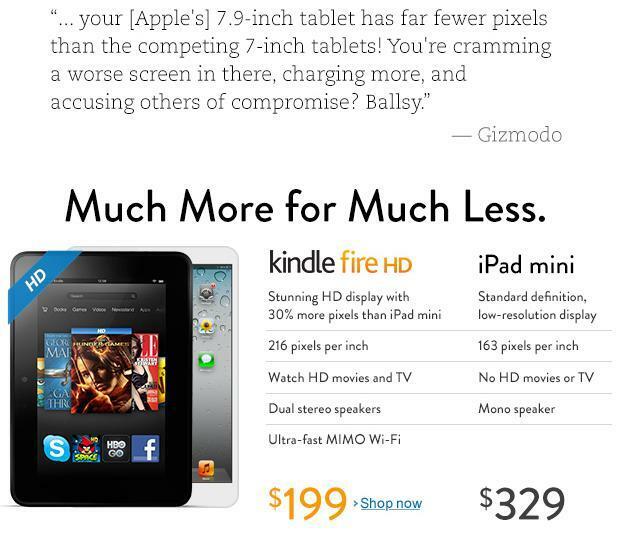 Visitors to the front page of Amazon.com right now are being greeted with the image you see above that shows a quote from Gizmodo comparing the two, and a listing of a short spec comparison between the Kindle Fire HD and the iPad mini. Going by what Amazon is showing, the choice appears to be a no-brainer, but as every knows, the proof will be in the pudding. We’ll see how they match up against one another once the iPad mini hits pre-order customers this Friday and retail stores shortly thereafter. It appears that this holiday shopping season may indeed get interesting as companies battle for the consumer dollars when it comes to 7-inch tablets.